During a recent trip to the UK I had the chance to spend half a day wandering through the immense and absorbing Portobello Market which takes place every Saturday in the Notting Hill area of London. A little over half a mile long, is best known for its antiques, but has four other distinct sections including Fruits and Vegetables, New Goods, Fashion Market and Second Hand Goods. Portobello Road itself has an interesting history. It is named after an 18th Century farm in the area which itself had been named after an important naval victory in the comically named War of Jenkins’ Ear. Apparently, this British-Spanish conflict began when said Mr. Jenkins, Captain of a British Merchant ship, told an appalled House of Commons how the Spanish Coast Guard had boarded his ship, tied him to the mast, and sliced off his ear as a warning. He then displayed the severed ear which he had kept pickled in a jar as evidence. As far back as the 19th Century the Portobello Market was known as a food market. 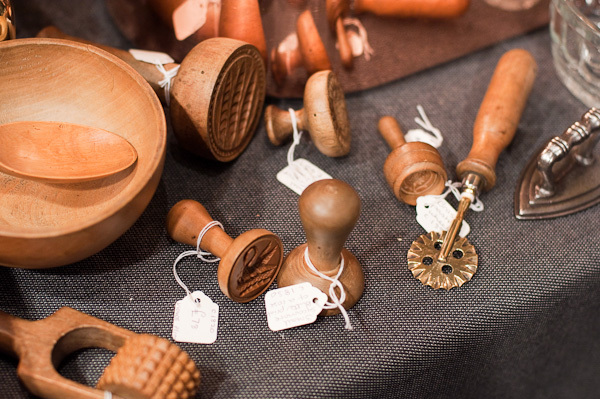 Beginning in the 1960s it became a home for antiques dealers and is now one of the world’s largest antiques markets. Some of the antiques shops are open during the week, but on Saturdays they all are, and in addition numerous vendors set up tables in the street. The shops can be deceptive from the outside, many of them are divided into many stalls each specializing in a particular category or period of antique wares, so be sure to explore in detail. In one of these enchanting arcades I found Mike Witts of Appleby Antiques who specializes in antique Kitchenalia, in particular, 18th Century copper cooking vessels and moulds. It turns out he works often with food historian Ivan Day whom I had just heard speak at this year’s Oxford Symposium on Food and Cookery. Ever since I started making fruit jams at home using Christine Ferber’s old fashioned (no pectin required) recipes, I have coveted a good copper preserving pan, which is what she recommends to make the best preserves. Speaking with Mr. Witt I learned that often in the past, large brass kettles were used for preserving as well. Brass, being an alloy of copper with zinc, is less likely to react with acidic ingredients. Unfortunately — or maybe fortunately because then I would have had to squeeze it into my luggage — he didn’t have any on hand at the moment. However, I will be keeping an eye on his his web site. Thankfully, the shopping wasn’t a complete bust because I scooped up a couple of Victorian-era Wedgwood egg cups from a different vendor — much easier to fit in the luggage. 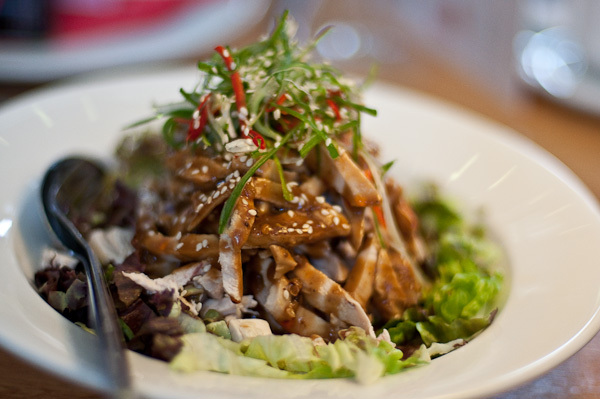 When you’re tired of shopping and need something to eat Portobello Market doesn’t disappoint. There was lots of mouthwatering street food being concocted right before my very eyes. 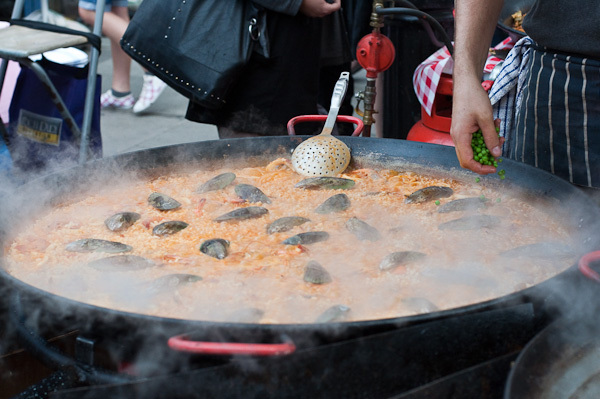 I chose a stew of chorizo, chickpeas, tomato and other vegetables, ladled from an enormous bubbling cauldron, but there were also giant pans of paella and one vendor carving bits from an entire spit-roasted pig. Much better than hotdogs, I’ll say! This is the second post in a two-part round-up of this year’s Oxford Symposium on Food and Cookery which took place from July 9-11, 2010 at St. Catherine’s College, Oxford. This year’s theme was Cured, Fermented, and Smoked Foods. You can find Part I here. Gallaghers Boxty House Boxty Potato Dumplings in a Crozier Blue Cheese Cream Sauce. 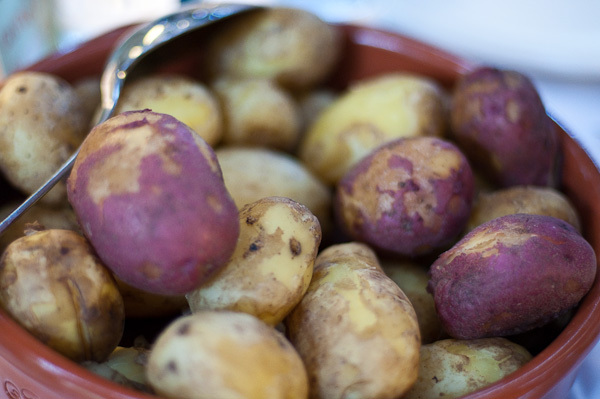 It's not an Irish feast without New Potatoes. served with Cuinneog Irish Butter, Sauteed York Cabbage, Champ Potato, Parsley Sauce, and a Cider & Wholegrain Mustard Sauce. 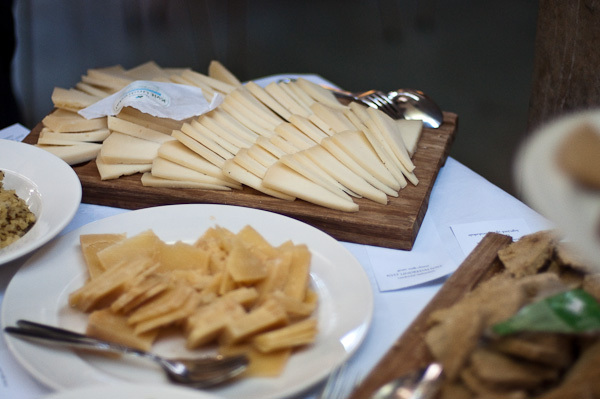 A selection of Irish Cheese with Ditty’s Home Bakery Traditional Oatcake Biscuits and Foods of Athenry Porter Cake. 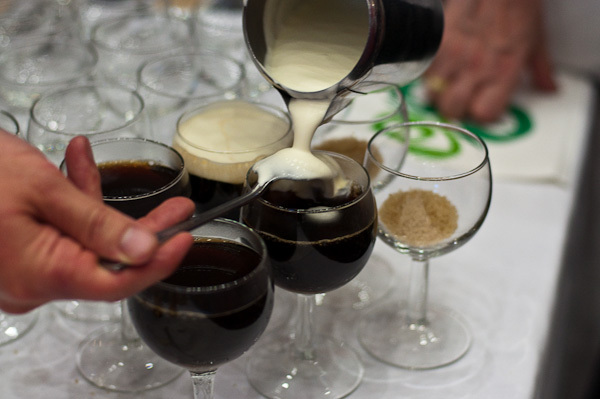 Irish Coffee made with Kilbeggan Finest Irish Whiskey. If you think that was a banquet (and it was!) wait until you hear what we had for lunch on Sunday for the final meal of the symposium. Several members of different Slow Food Convivia in Norway conspired to bring us a traditional (and sustainable!) Norwegian Lunchbord. The ingredients arrived via sailing ship from Bergen via Cardiff and were then prepared, under the direction of Pål Drønen and Margareth Tislevoll. Sølvisild, sullsid, and hardrøykt sild – silver herring, gold herring, and hard cured herring from Jnardar AS, Leinøy, Norway. Røkelaks “Lærdalslaks” – smoked salmon from Sognefjord Gourmet, Årdal, Norway. all from Villfisken AS, Hallingby, Norway. Tørrfisk – stockfish from Lofotskrei, Ballstad, Norway. Rødsei – red saithe or old salted saith Pollachius virens from Seløy fisk, Herøy, Norway. Speket viltpølse – cured game sausage from reindeer, red deer, and lard from Li gardstun, Aurland, Norway. Speket Geitepølse – cured goat sausage from Sturle Ryum, Gudmedalen Fellsfjøs, Aurland, Norway. Fenalår, and speket lammepølse – cured leg of lamb, and lamb sausage from Ekta Skåramat, Granvin, Norway. 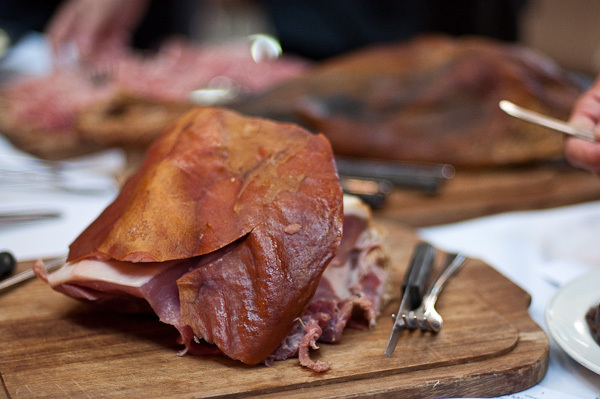 Spekeskinke – cured ham from Ekta Skåramat, Granvin, Norway. 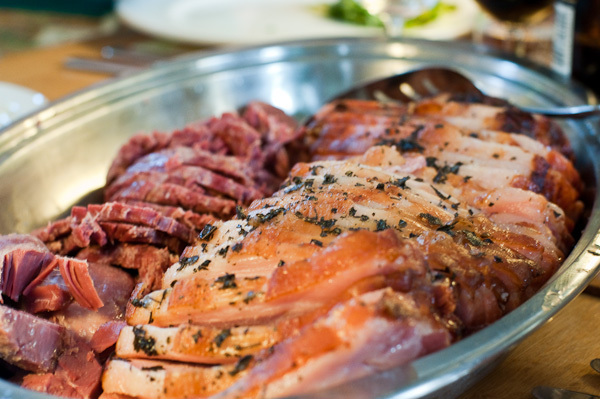 Saltet og røykt lammebog – salted and smoked shoulder of lamb from Holo gard, Flåm, Norway. Røykt lammepølse – smoked lamb sausage from Ekta Skåramat, Granvin, Norway. Pultost – a crumbly sour-milk cheese from Helen Dave, Vesterhaugen Gårdsysteri, Våler, Norway and Tore Skarpnord, Høgda Gardsmeieri, Brumunddal, Norway. Gamalost – a cooked sour-milk cheese from Maria Ballhaus, Sogn Jord-og Hagebruksskule, Aurland, Norway. Jærost – semi-hard cows’ milk cheese (10 months old) from Voll ysteri, Voll, Norway. Brimost – brown goats’ milk why cheese (fresh) from Rallarrosa Stølsysteri, Flåm, Norway. Tjukkmjølk – “thick milk,” organic cultured milk from Rørosmeieriet, Røros, Norway. Rømme and smør – organic sour cream, and butter from Rørosmeieriet, Røros, Norway. Lefser – soft flat bread from Leveld lefsebakeri, Ål, Norway. Flatbrød – crisp flat bread from Veitastrond flatbrødbakeri, Veitastrond, Norway. and Gardsbutikken, Øystese, Norway. Hermetiske moreller and “Mallard” plommer – preserved sweet cherries and “Mallard” plums from Nøring ANS, Øystese, Norway. Hermetiske epler and pærer – preserved apples and pears from Syse gard, Ulvik, Norway. Sirupstynnkake – syrup wafers from Brynhild Levang, Rendalen, Norway. Nøgna Ø India Pale Ale and Nøgna Ø Imperial Brown Ale from Nøgna Ø, Grimstad, Norway. Lysholm Linie aquavit from Arcus, Oslo, Norway. Next year, the theme at the Oxford Symposium will be “Celebrations.” After this, I can’t imagine what they will come up with. This is the first of a two-part round-up of this year’s Oxford Symposium on Food and Cookery which took place from July 9-11, 2010 at St. Catherine’s College, Oxford. The weather was unseasonably warm and I was glad the College Bar — why don’t American colleges have official bars? It’s so civilized — opened at 6PM on Friday evening providing a refreshing Gin and Tonic. Not long after, our first meal began with a glass of German Sekt and some Prosciutto di Parma in the garden as Chef Raymond Blanc announced the winners of this year’s Young Chef’s Grant who got to help prepare Friday evening’s dinner along side Chef Jeremy Lee of London’s Blue Print Cafe. Congratulations to winners Max Barber, Elaine Mahon and Daniel Penn. To kick off the weekend Mr. Lee conceived a Feast of Cockaigne, the imaginary land of Medieval legend, where there is always plenty of food and drink and no one has to work very hard. with abraised green beans with a green sauce. Almond meringue with berries and whipped cream, sometimes also called Eaton Mess. On Saturday afternoon after fascinating plenary talks by food scientist Harold McGee and anthropologist Sidney Mintz and some papers about ancient Roman fish sauce. I was ready for lunch. Lucky for me, it was provided by renowned Chinese food expert Fuchsia Dunlop and the chefs from London’s Barshu Restaurant where she is a menu consultant. The wine was a 2008 Riesling Trocken “Kraut wine,” weingut tesch from the Nahe wine region in Germany. And so it was back to the intellectually stimulating portion of the program. During the afternoon I attended presentations about a fermented bread from Transylvania which is purposely cooked in such a hot oven that the outside layer turns to charcoal; the history of eastern European Jewish pickled foods in Canada; and Ken Albala’s inspiring talk on the “Missing Terroir Factor in Historic Cookery.” His new book is right at the top of my to-buy list. Part Two of this summary of Oxford 2010 will go up next week. See you then. Just a quick note from the Oxford Symposium on Food and Cookery. As this year’s theme was Cured, Fermented and Smoked Foods, I got to try lots of unusual preparations from around the world, the most striking of which was Swedish surströmming. Food science maven Harold McGee spoke about it in his Plenary presentation titled “A Chemical Introduction to Cured, Fermented and Smoked Foods.” Surströmming is made from herring that is caught in the spring, the heads are chopped off, but the guts are left in. The fish are then packed in a barrel with salt which is put in the sun for several months. It is then re-packed into unsterilized cans and aged for six months to a year. Fermentation continues in the cans and sometimes they bulge. To those of us (including me) whose mothers taught us never to buy a bulging can from the supermarket, this all sounded rather terrifying. 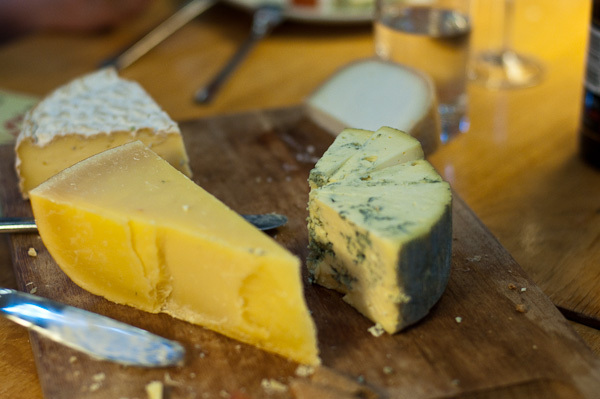 However, it is important to note there are many types of bacteria, some of which are helpful to us humans allowing us to make cheeses, pickles, sauerkraut, and other cherished foods . In many fermentation processes, the “good” bacteria create an acidic environment where “bad” bacteria (like botulism) cannot survive. 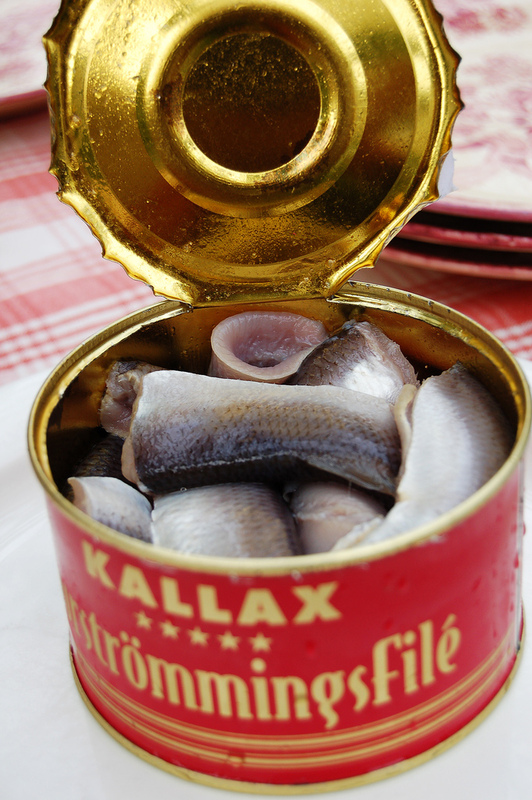 A Japanese laboratory analyzed some of the cans used for making surströmming and found and important (non-harmful) bacteria on their surfaces which contributes to the fermentation process. In other words, if the cans had been sterilized, the process may not have worked properly. As the smell billowed upwards, birds began to drop dead from the sky. During Saturday’s tea break we all got a chance to try some of this pungent concoction served with pieces of soft Swedish tunnbröd. The can was opened outdoors due to the odiferous nature of this traditional food. Considering that they only opened one small can and you could smell it about half a block away, I’d say this was a good decision. When I ventured outside to see what was going on, I was struck by a very strong earthy, loamy odor which reminded me of durian. Surprisingly, it did not smell fishy. I got up my courage and tried some. The flavor was not fishy either, it was very ammoniated like a cheese that has been allowed to ripen too long. One of my fellow tasters commented that if there was such a thing as fish cheese, it would taste like surströmming. I don’t know that I’ll be rushing out to buy some, but it was not nearly has bad as I thought it would be. In another part of his presentation, Harold McGee told us that scientists have recently discovered that the brain can differentiate between smells that enter only through the nose and those that go from the mouth to the nose. The brain treats these differently, so sometimes something that smells revolting can taste pretty good. Perhaps the moral of the story is that your parents were right to say that you should at least try everything. The highlight of my food history year is coming up this weekend. I’ll be attending the Oxford Symposium on Food and Cookery in the UK. This annual gathering of food historians includes both professionals and enthusiastic amateurs and focuses on a specific theme. 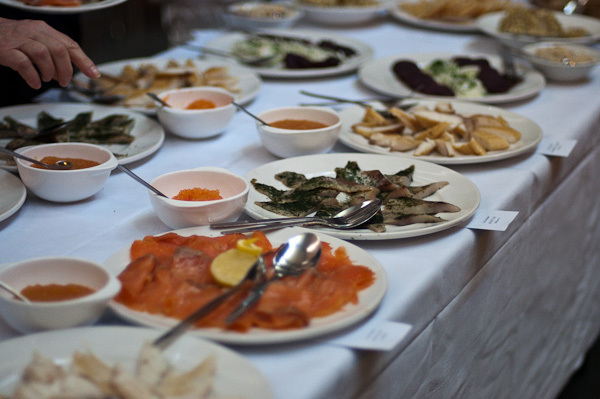 This year we’ll be exploring cured, fermented, and smoked foods. These are some of the most ancient techniques for preserving food and are used all over the world. 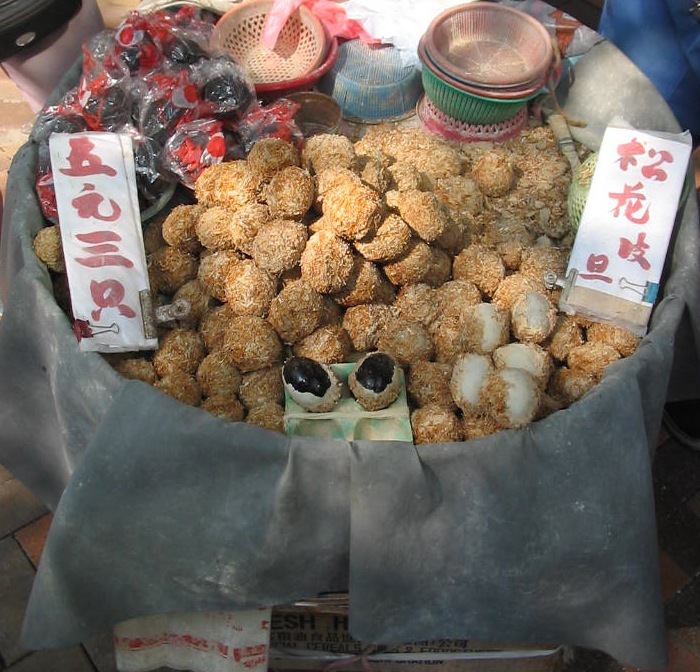 Some of the papers to be given at the symposium include: “Sausages of the Classical World” by historian Joan Alcock, “Rotten vegetable stalks, stinking beancurd and other Shaoxing delicacies” by Chinese food expert Fuchsia Dunlop, and “Smoke and Mirrors? Montreal smoked meat and the creation of a tradition” by Alan Nash who specializes in the geography of food. Aside from all of this intellectual stimulation, as you might expect, there is lots of good food. 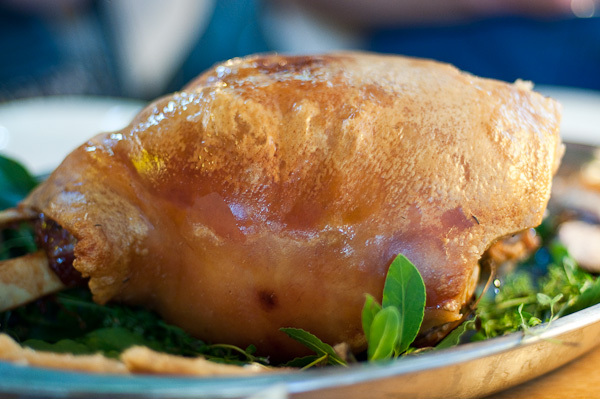 On Friday evening we will be treated to a Feast of Cockaigne by chef Jeremy Lee of the Blueprint Cafe in London. For this menu, Mr. Lee imagines the kinds of food which might be served in the mythical land of Cockaigne where no one has to work very hard, and luxurious food is just an arms-length away (think Big Rock Candy Mountain). Saturday’s lunch is a Sichuan meal brought to us by the chefs at London’s Barshu Restaurant where the aforementioned Fuchsia Dunlop is a consultant. Having cooked several dishes from her superb cookbooks, I’m really looking forward to this one. On Saturday night Pádraic Óg Gallagher of Gallagher’s Boxty House in Dublin will ply us with traditional Irish foods using first class artisanal ingredients. Finally, our lunch on Sunday will be particularly historic as the ingredients will reach us by sailing ship! A Dutch company has decided to go back to the old ways and is providing sustainable transport using sail power to ship goods around the world. The Brigantine “Tres Hombres” is one of their ships and it will be used to send traditional Norwegian foods to the symposium, which will then be transformed into a buffet for us by Ove and Svein Fossa from the Norwegian branch of the Slow Food Movement. 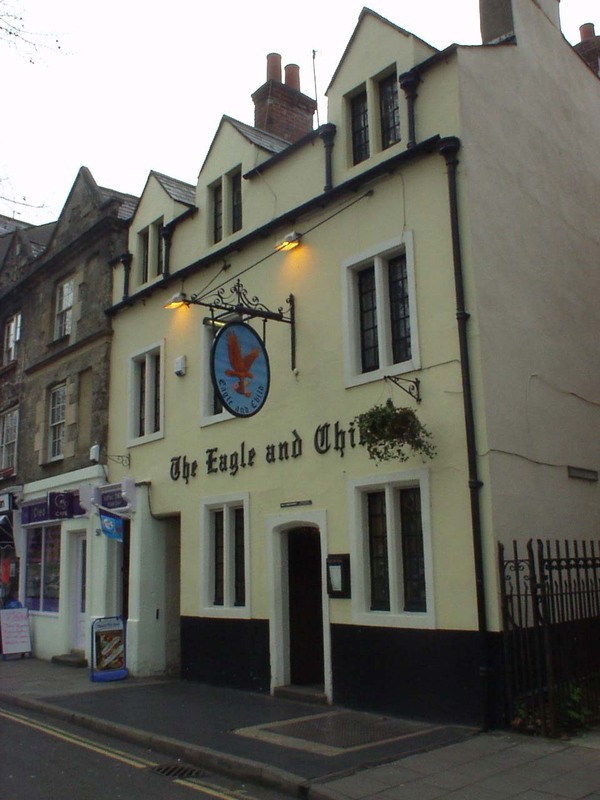 After the symposium, I’ll be spending a little time in Oxford, trying out some local Real Ale and poking about in libraries. Then it’s off to London for some research on another project. I’ll be posting short notes from the road when I have Internet access, and I’ll do a more detailed round up of the Oxford Symposium when I get home. Next month I’ll be attending the Oxford Symposium on Food and Cookery in the UK. Each year, this conference on food, its culture, and its history focuses on a different theme; this year it’s Cured, Fermented, and Smoked Foods. Living in a New York City apartment, the temperature and humidity of which is difficult to control at the best of times, it will be a while before my fantasy of making my own Prosciutto is realized. Smoking can be a bit easier. I have a friend who makes tea smoked duck, and homemade smoked sausages using a large wok with a rack and a lid. However, there is that pesky smoke detector to contend with. On the fermenting side, the only thing I’ve tried is homemade yogurt. In preparation for my upcoming trip to Oxford, I thought it high time I explored another aspect of this intriguing method of food preservation. If I were living about 3000 years ago on the Indian subcontinent, I don’t know that I would have come up with the idea of soaking cucumbers in salty water and spices in order to preserve them, but our Indian friends certainly knew what they were doing. In many English speaking countries the word “pickle” by default means a pickled cucumber, even though we humans have been pickling lots of other fruits, vegetables, and meat for thousands of years. Cucumbers are believed to have arisen in India. From there they spread to Ancient Greece, and the Romans took them all over the empire. It just so happens that my local farmers’ market currently has piles of Kirby cucumbers of just the right size for making pickles. As a New Yorker, I couldn’t resist trying to make Kosher dills. Technically, since my kitchen is not Kosher, the pickles aren’t either, but the name refers to a particular style of pickle found in New York Jewish delicatessens that is known for containing plenty of garlic. I was surprised at how easy these are to make. They don’t take nearly as long as some other fermented foods (sauerkraut, for example). The pickling spice I used contains some red pepper flakes which produced a pleasant spicy kick along with all that lovely dill and garlic. Plan ahead and make a couple of jars to bring along to that lucky friend’s house who has a grill. Sterilize your canning jar by baking it in a 225 F oven for 5 minutes. In a medium saucepan heat the salt and water until the salt is dissolved. Turn off the heat. Cut both ends off of each cucumber. The blossom end contains an enzyme which can cause pickles to go mushy, it can be difficult to tell which end that is, so just cut a little off of both ends. Pack the cucumbers into the jar vertically, as tightly as you can. Distribute the garlic, spices, bay leaves, and dill around and between the cucumbers as you are packing. A clean chopstick can be helpful for pushing the dill and garlic into small spaces. If you quarter each cucumber lengthwise you will be able to pack more into your jar. If you do it that way, buy more cucumbers than listed above, so they will be packed tightly. When the jar is packed ladle the warm brine into it. Fill the jar so that the tops of the cucumbers are completely covered with brine. You probably won’t use all of the brine, but it’s better to have too much than not enough. Cover the top of the jar with a piece of cheesecloth and secure it with the rubber band. Put the jar in a cool dark place for 3-6 days to allow the pickles to ferment. After 3 days taste them and see if they are to your liking. If you chose to quarter your cucumbers they will be finished sooner. 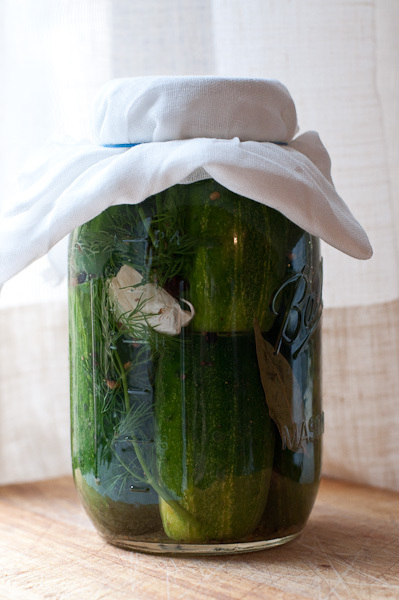 A longer fermentation time makes for a more sour pickle. When they taste the way you like, remove the cheese cloth, put the lids on the jar and refrigerate your pickles. Put the peppercorns, mustard seeds, and coriander seeds in a small dry skillet. Toast them over medium heat until fragrant, stirring constantly. Transfer the toasted spices to a mortar and pestle and crush them slightly. Combine the toasted, crushed spices with the rest of the ingredients, mix well. Store in an airtight, opaque container.